The #PerfMatters Conference will take place March 31 & April 1, 2020, in the Cañada College Theater. The theatre is ADA compliant with handicap parking spots in front of the theatre. Coffee, snacks, lunch and the after party will be held in The Grove. The Grove, a 4,537-square-feet open space lounge, has a beautiful view, and is also ADA compliant. To not get completely ripped off in the Bay Area, you'll want to either do an AirBnB or stay at a motel along El Camino Real. Motel rooms are going to run you $140 to $220 per night, El Camino has it's pros and cons. It is a busy street, so it can be super loud, but all the hotels are along the freeway, so no matter where you stay, freeway / busy street noise will be the same. Unlike the hotels, the motels on El Camino Real are in walking distance of the Caltrain and the restaurants. The hotels are on the east side of the freeway, so you'll need a car to catch public transportation or find go out to eat. Eaither book way ahead of time, or book last minute. The room is $208 per night at the time of the posting, but will be $150 to $190 the day before. If you book a week out, it will be about $260. Try calling them to get the deal if you don't like the price, but realize they will NOT call you back, so call until you get thru.. The name says 'hotel', but it is actually a motel. This motel is clean and decently decorated. It's actually pretty cute. It is next to downtown San Carlos, and near the San Carlos CalTrain station, so there are restaurants and public transit to SFO within walking distance. San Carlos is safe suburbia right next to the more happening Redwood City. At only $75 to $125 on their website and $100 on Hotels.com, this is currently a bargain. Belmont is 2 towns north of Redwood City. The money saved is will pay for a Lyft several times over. This is "on the other side of the freeway" so you'll want a car, but if you have no bags, it's a 15 minute straight shot to the Caltrain station. Reviews are mixed. It seems like a bare bones hotel with cute colors and hit or miss front desk staff. Hobbee's, the breakfast place next door, is yummy, but there isn't much else around -- unless you walk back to the Caltrain Station: there are a few restaurants and supermarkets in that neighborhood. This mostel may be a quieter hotel since the rooms look over the pool rather than the road. $199-$225 if booked ahead of time. $99 to $135 if booked last minute (but there may not be availability). This hotel is closest to all the action of downtown Redwood City, which is both a good and bad thing: next to a bunch of restaurants, the movie theater, Caltrain, Whole Foods. This motel is ON the freeway exit, but it's inexpensive at $150/night. There is nothing around there, except an IHOP and the ARCO gas station convenience store. The rooms have recently been renovated and are alledgedly quite comfortable. A group of people are definitely staying at this motel. It's $140 to $209 for a suite. The rooms have recently been redone, they look nice and comfortable, and the staff seem decent.. Wifi and breakfast included. It's on the San Carlos/Redwood City border, so is a bit of a walk to either Caltrain station. There are restaurants and a Trader Joe's nearby.The bar called "The Office" is actually the most happening bar around. (I don't get it either). If you use Hotels.com, the deal is good. If you don't use that website, use your AAA card to get a 10% discount via the Red Lion website. The rate goes down to $89 for reservations the day of, but as many of us are staying here, the least expensive rooms are already gone. Looking to save money by sharing a room? Looking to help someone out who doesn't have the budget for a bay area hotel room? Please join the #PerfMatters Slack channel and find a roommate. If you do have a hotel room, consider offering up the second bed in your hotel room to someone who doesn't have corporate sponsorship. The Pacific Euro Hotel is a 1-star Hotel at 868 Main St, Redwood City, CA: If you want to stay at the most inexpensive place around, this is it. It's a dumpy hotel with parking that is metered from 10:00am to 6:00pm. I think it has shared bathrooms and the internet is not secure, but the location and price are great. The hotel is located downtown, near all the restaurants and coffee shops. There are a few homeless people on that block, but it's a safe city. We can not recommend this place at all. However, if you don't have corporate sponsorship for your hotel stay, it is the only place on the Peninsula that is under $100. I think it's about $69/night with shared bathroom, $89/night with your own bathroom. Marriot will run you $349+, and they're jerks, and their pool has never been opened (they'll tell you it's temporarily being fixed) so please don't give them your money. They don't deserve it. Help support one of the idependently owned motels above instead. Cañada College is a community college located half way between San Francisco and Silicon Valley. The campus is at 4200 Farm Hill Boulevard in an unincorporated area of San Mateo County, California, just off Highway 280. Parking: No permit needed, but park in a student lot. It is spring break at Canada College, so they are not enforcing student permits, but they are still enforcing all other permits and parking rules. Please park in a student lot, and definitely not in any parking lot reading "staff only". Parking lot #6 seems to make the most sense.If you're coming by car, there is ample parking. Park your car in lot #6. From the east bay, take the Dumbarton Bridge (84 West). Continue onto Marsh Road, staying on 84 West. Take 101 north, staying on 84 West, to exit 408, Woodside Road. Take Woodside Road / 84-West all the way to 280. Take 280 to exit 27. Head east on Farm Hill Blvd. At the first light, about 0.8 miles, take a left onto The Loop Road to enter the campus. Note: If you have a handicap parking permit, stay left at the fork in the road continuing on The Loop Road, and park in lot #4. All others: Head left onto Campus Circle at the fork. Park in parking lot #6, which is the first lot on the left. See parking details above. From the east bay, Hayward or farther north, or the coast, follow the directions above, taking 92 to get to 280. If you're coming by public transportation, you'll want to catch the bus from the Redwood City CalTrain station. Catch bus #274 from the Redwood City Transit station, just opposite the Redwood City CalTrain station, lane C.. The bus leaves every half hour at 14m and 43m past the hour, and take 23 minutes to get to campus. The 8:14 and 8:44 am buses are your best bet. Fare is $2.25. Leaving the venue, there is a 7:03, 7:45, 8:45 and 9:45 pm to get you back to Caltrain. There is also a 5:03 and 5:33 for monday's workshop and Wednesday after the conference. If you see a bunch of people waiting, ask if they're heading to Canada College, or back to the city, share a Lyft (not an Uber). By Plane: SFO, SJC, and OAK are all A.O.K. While SFO / San Francisco will have the best direct options, realize the conference is half way between SFO /San Francisco and SJC / Norman Y. Mineta San Jose International Airport. A little less convenient, but still completely doable, and just and extra 8 miles further, is OAK / Oakland International Airport, in Oakland, CA. In order to have an inclusive event with a welcoming atmosphere, we hope to remove all accessibility barriers that may hinder anyone from attending this event. If there are any issues that you feel may prevent you from attending and fully enjoying this event, we will do our best to accommodate, but we need to know ahead of time as best we can what those issues may be. Please get in touch and let us know what we can do to help. Venue Access: The conference is a one track in an ADA compliant, yet not fully accessible, theatre. There is a ramp to get to the theatre, and a lift to get up the five steps from the entrance to the theatre foyer. Stepless access within the main theater includes the last row, the first two rows, and the stage. Parking: There is accessible parking directly between the theatre and The Grove. There is also accessible parking in parking lot 6 near both venues. If you have an accessibility parking placard and are able to walk a flight of stairs, please use the parking in lot 6, leaving the five spots between the two venues for those unable to otherwise access the venue. Accessibility Assistance: If you need assistance, such as a Sign language interpreter, a complimentary ticket will be provided. Personal Care Attendants can attend any session, meal, or function with the registered participant they are assisting at no charge. They do need to register though, so let us know. If you aren't local, please contact us. We'll try to find an interpreter or other form of Personal Care Attendant you may need for the event. 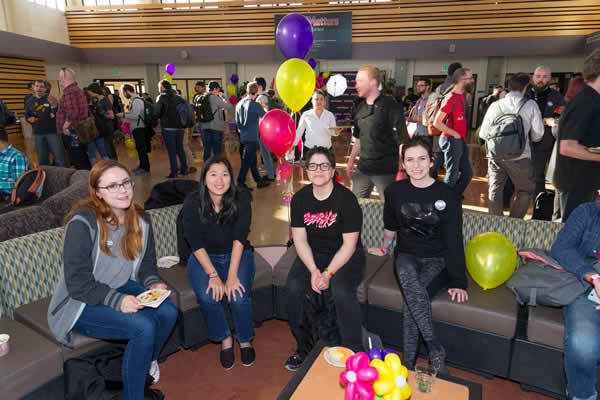 Quiet Area: While there is no specifically identified quiet area for introverts or others needing to decompress, the event takes place on a college campus during spring break. It is full of little nooks and crannies for anyone needing to step away. Mother's room: While the campus has no mother's room available for the conference to rent, we have created a space within the building housing the theater with a lounge chair and some privacy. Just ask any conference staff to direct you. Restrooms: There is a multi-stall restroom with urinals, a multi-stall restroom without urinals, and 5 single stall restrooms. Diversity Tickets: There is a diversity program to bring more people from typically under represented people in tech into the web performance family. Partial scholarships are also open to freelancers and others without corporate sponsorship. Food & Allergies: There are meat and vegetarian options. Please let us know when you register if you are vegan, celiac, or have other dietary requirements needing our attention. Housing assistance: There is a slack for the event, including a slack channel dedicating to "housing". Join the #PerfMatters Slack channel. If you are willing to share your company (or personally) paid hotel room with someone who can't afford it, or live near the venue and willing to host an out of town guest, we encourage you to post your availability in that chat room so people who need assistance can privately DM you to take you up on your generosity. Certificates of completion available if requested ahead of time. * In terms of diversity scholarships, priority will be given to those attending five or few events a year or have otherwise demonstrated an interest in the topic of web performance. This is not an open invitation to the local conference hopper contingent.